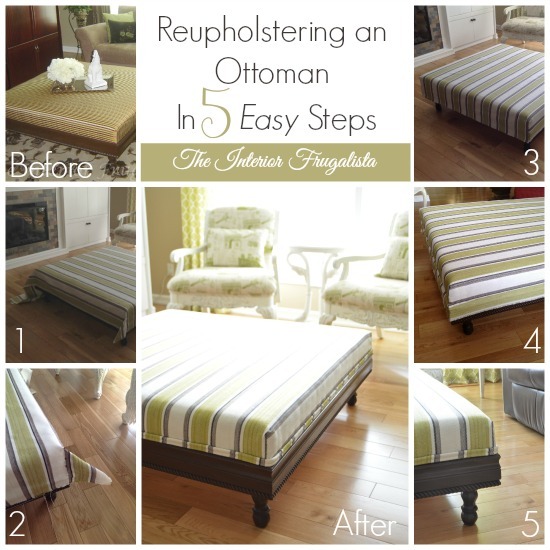 How To Upholster An Ottoman In 5 Easy Steps! What to do when you replace your old sofa and now the ottoman looks like crap. Instead of spending the big bucks to replace it, why not give it a fresh new look for a fraction of the cost? 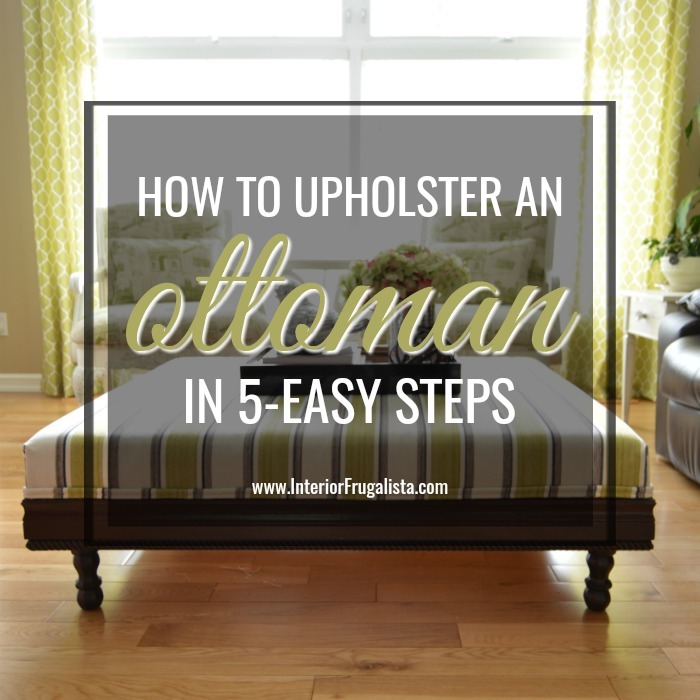 I did and it wasn't very difficult and so I'm sharing a tutorial on how to upholster an ottoman in 5 easy steps so you can too. Recently we replaced our sofas and updated a pair of Queen Anne armchairs for our living room but our large DIY ottoman no longer worked with the new furniture. Getting rid of it wasn't an option for a few reasons; a) it has sentimental value because we built it ourselves, b) it's large custom size is a perfect coffee table for entertaining and c) it serves as a footstool for all the seating around it. This is what the ottoman used to look like when we had a lot of brown and red in this space. 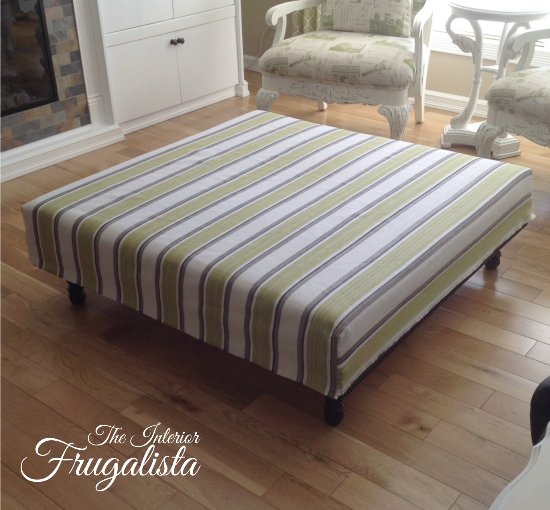 Like I mentioned above, Mr. Frugalista and I built this ottoman after I watched an episode of Steven & Chris, a popular Canadian lifestyle show. Here is a link to their DIY Ottoman Building Plans but you can see that we altered the plans somewhat by nailing wood trim along the base. During a shopping trip to Fabricland, a Canadian fabric retailer, I was thrilled when I came across the green, brown, and white Mayer French Ticking fabric. With my membership, I received a discount of 50% off per meter. 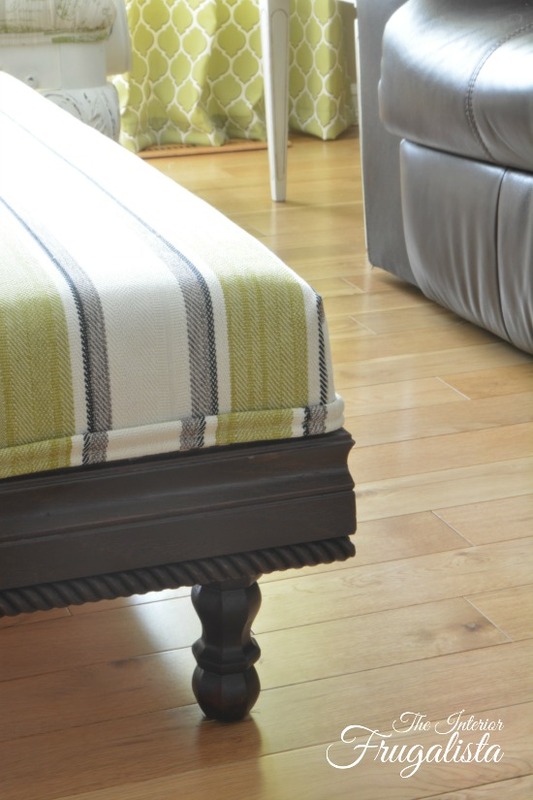 Refreshing the look of our ottoman was super easy and being a novice at upholstery if I could do it, you certainly can. I don't claim to be an expert and may not have done this according to the rules of professional upholstery but I think it looks pretty darn good. Normally I would recommend you remove the old fabric first but because my new fabric is a heavyweight cotton, the old fabric doesn't show through. 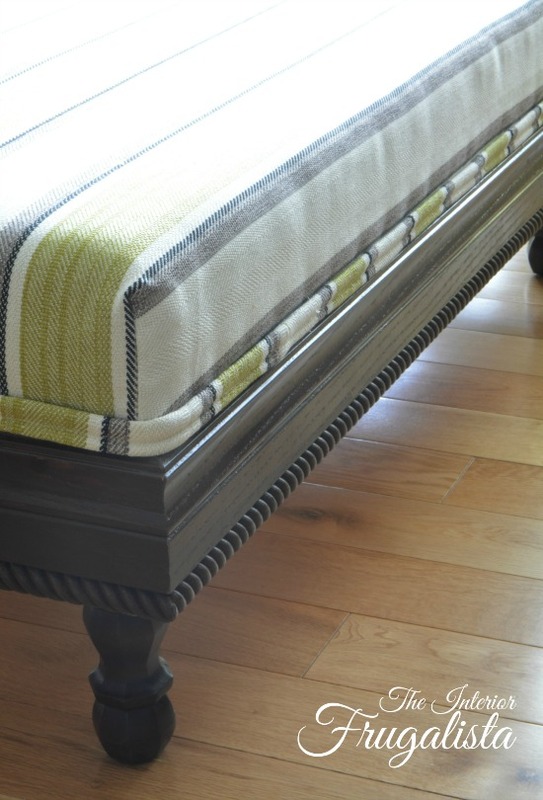 Place the fabric over the ottoman with the wrong side facing up. Line up the stripes nice and straight. Pin the corners on one side ONLY as pictured below. Remove the fabric and sew a straight stitch along where you pinned. 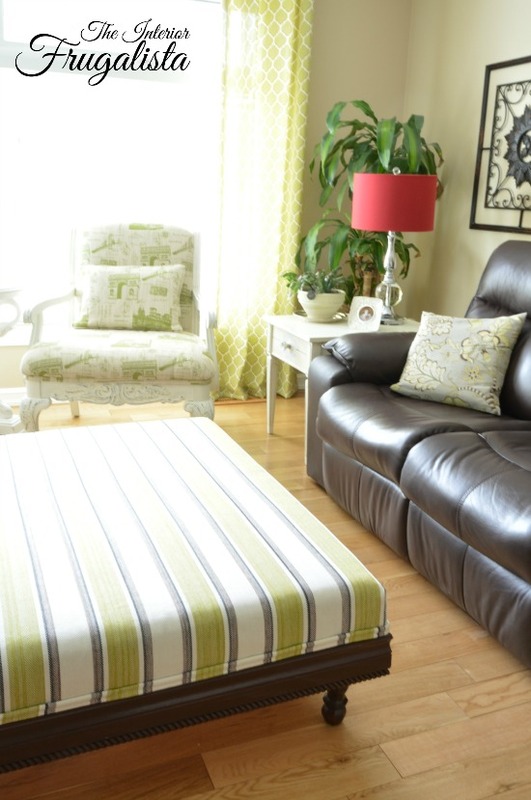 Place it back on the ottoman to ensure it fits well and adjust the seams accordingly, if necessary. 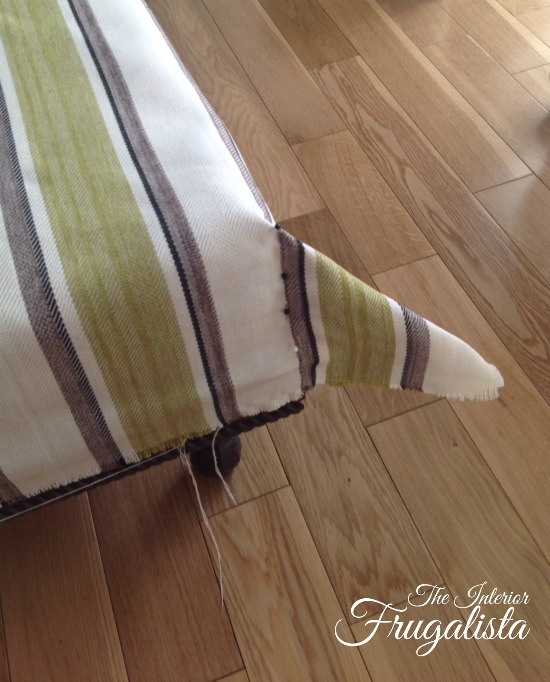 Place the fabric back onto the ottoman wrong side facing up and pin the opposite two corners. You want a tight fit but not too tight that it compresses the foam or distorts the stripes. Sew the corners with a straight stitch like in steps 1 & 2. 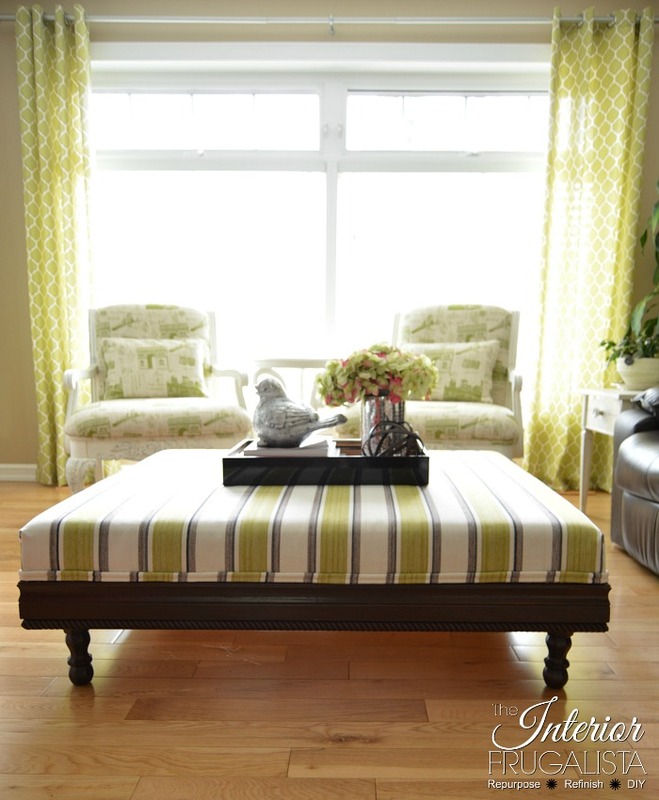 Turn the fabric right side out and place it over the ottoman to ensure a good fit. Once you are satisfied with the fit, turn it inside out again and cut off the excess fabric, leaving about a 1-inch seam allowance. 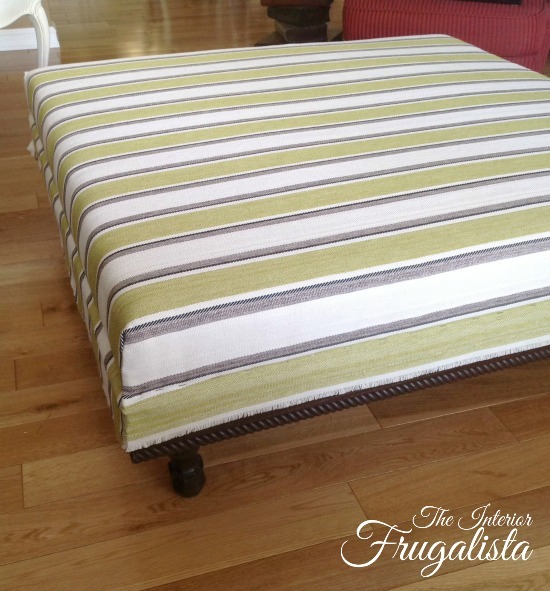 Slip the fabric cover over the ottoman. 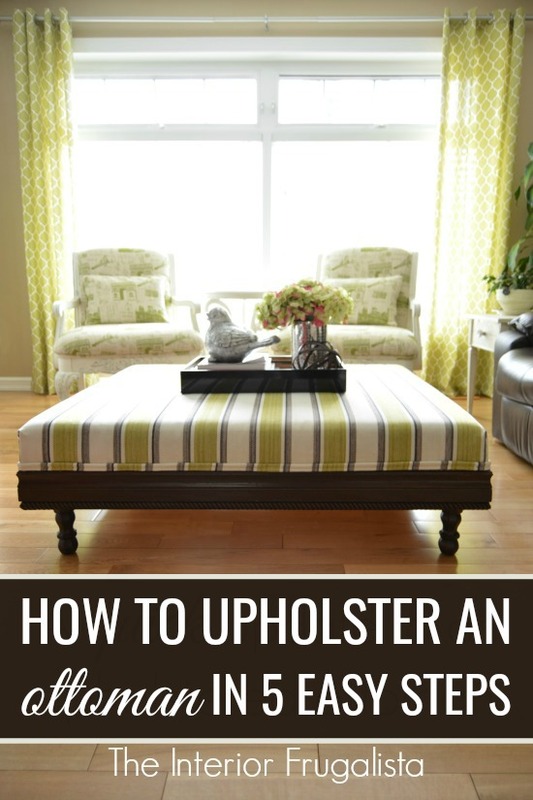 With an upholstery staple gun, staple the fabric onto the wood frame. Start from the center on one side and work your way outwards. Repeat on the opposite side, checking to make sure the fabric is not being pulled too tight where it distorts the stripes. Repeat for the opposite sides. Cover the staples with either decorative gimp trim or single/double welting also known as piping. Hot glue the trim onto the fabric. I chose double welting using the same fabric and inexpensive clothesline cord from Home Depot. Here is a link to a detailed tutorial on how to make welting from my friend Christy's blog. 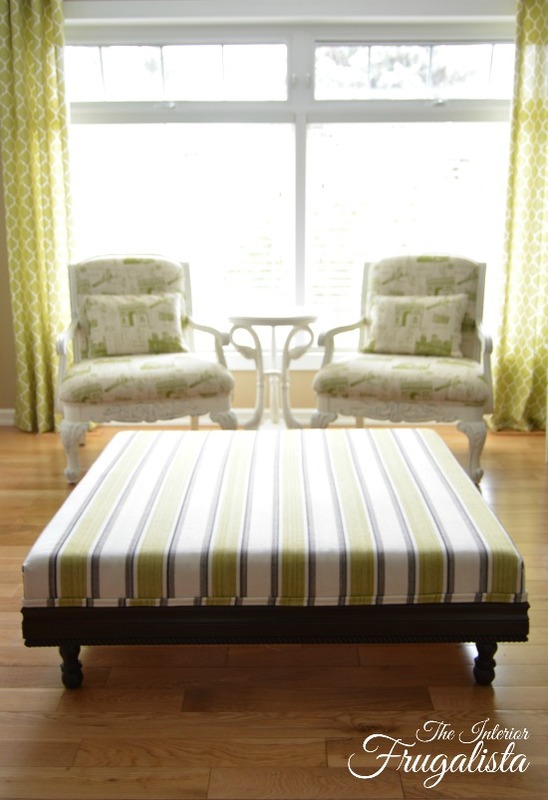 If I had a do-over I would stagger the stripes on the piping with the stripes on the ottoman to add more interest. Lining the stripes up perfectly, like I tried to do, is impossible. That's it, five simple steps to upholster an ottoman and I'm pleased with how it turned out. For tutorials on how to upholster a bench, see my posts Queen Anne Coffee Table Turned Upholstered Bench and 70's Coffee Table Transformed Into Upholstered Bench. So what do you think - did I make the right choice? Is this something you think you could give a try after reading this tutorial? Perhaps you already have. I'd love to hear about in the comment section below.